Thank you for your interest in eco-friendly funerals. Our firm offers five different "green funeral" packages as a way to provide a meaningful funeral while also reducing the environmental impact that traditional funeral services have had on our land, such as putting steel, concrete and toxic chemicals in the ground. The word "green" is generally used to describe that which is not harmful to the environment. Two things are important to remember... one is that you don't have to be all-green or not-green. We can recommend any combination of ways to begin respecting our environment by doing as much or as little "green" as you wish. There are different tiers of green, all of which can contribute to a more environmentally friendly sendoff. Remember, as funeral service professionals, we are here to make recommendations for an adequate and proper funeral and most of all, to give the families what they want. We respect your choices. The other factor is that eco-friendly funerals can be arranged when needed, or they can be pre-planned ahead of time, a choice which will certainly be appreciated by one's children when the time comes. A pre-arranged funeral can be made with green components which will help improve our environment in the future. In general terms, these involve holding the deceased remains without embalming (no toxic chemicals) or in some cases, formaldehyde-free embalming. Also, the use of a biodegradable casket (designed to return to the elements of the earth) along with a meaningful celebration of life and shorter viewing periods are common. What is a "green" burial? This is usually in a woodland or open field setting, or can be on a private farm or property (in compliance with local laws and zoning.) The grave is marked by trees, rocks or flowers as opposed to a permanent marker or monument. No concrete vaults are used, and the graves may be dug by hand, conserving fuel. We are now fortunate to have a true green cemetery right here in the Lehigh Valley, the Green Meadow at Fountain Hill (see link below.) Our preparation room is equipped with modern, state of the art instruments and furnishings, including walk-in refrigeration and an emergency stand-by power generator which can supply the entire funeral home indefinitely in case of an electrical power failure. This way you will have peace-of-mind for any eventuality. Cremation is generally not considered green because of the large amounts of non-renewable fossil fuels burned during the cremation process. It is helpful, however in the sense that land is not being used for burial. For those choosing cremation, our funeral home offers several biodegradable urns which are suitable for burial in the earth or water. Our funeral home offers several different options for green funerals...ranging from full services with visitation to simple graveside services. 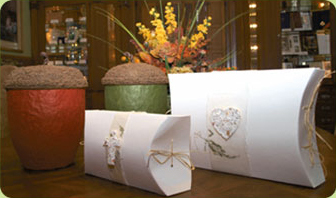 These packages are designed to help make funeral planning easier for you while creating a personalized, meaningful ceremony. The packages give you the added benefit of simplicity of choice. No embalming is required or included, and each includes your choice of a biodegradable Seagrass or Willow casket and an outer burial container, if required by the cemetery. A bamboo casket, and a wide variety of beautiful hardwood (all-wood construction) caskets are available as well. A funeral service at the funeral home with one-hour visitation prior to the service, burial to follow. A one-hour visitation (no ceremony) with a graveside service to follow. A direct burial with family only viewing prior (no ceremony or memorial package). An earth-friendly memorial package (register book and prayer cards...recycled paper made with hydro-electric energy, renewable cotton, soy-based inks) is also included with each plan except for the direct burial. Other all-wood construction caskets (no metal parts) are available, too. The good news is that these eco-friendly plans cost up to 30% less than other traditional funerals. For those who do not desire to use a casket (cemetery permitting), special shrouds are available (as seen on "Six Feet Under") as well as scented, aromatherapy washes for cleansing and bathing the decedent. We will gladly assist those wishing to have a personal, meaningful home funeral, as long as all state and local laws are adhered to (deaths in Pennsylvania only.) Such assistance may include transportation, help with permits and paperwork, etc.